A final year PhD student from Plymouth University Peninsula Schools of Medicine and Dentistry, who is part of a team working towards effective therapies for dementia, has committed to running a number of half marathons over the coming months in support of dementia research charity, BRACE. Tracey Evans is part of a team investigating the role of proteins in the development of dementia diseases such as Alzheimer’s and Parkinson’s. Her PhD post is part funded by BRACE. The protein study relates to a condition called dementia with Lewy bodies (DLB). Lewy bodies are tiny deposits of protein in nerve cells and it is believed that they account for 15 to 30 per cent of all cases of dementia. One protein is called alpha-synuclein and it is closely related to another protein, beta-synuclein. The research team is investigating whether and how interaction between the two proteins plays a role in preventing or slowing the build-up of alpha-synuclein. The results will help the team better understand how protein deposits build up in the nerve cells. By understanding the mechanism, and how one protein may inhibit the other, there may in time be a way of using the mechanism as a means to treat DLB. "Dementia is a huge health problem putting millions of people at risk worldwide, yet only one new drug has passed through clinical trials in the past ten years. Dementia research needs to be where cancer research is now." Tracey is personally affected by dementia – close family members have had Parkinson’s disease, Alzheimer’s and Parkinson’s disease with dementia. "The impact of dementia on individuals and their families is devastating. By the time people begin to show physical symptoms as much as 60 per cent of their neurons have gone. I am passionate about raising awareness about dementia and flying the flag for it so that we get more support to find ways to combat this dreadful group of conditions." Over the next few months Tracey will be running half marathons in Torbay, Indian Queens, Bristol and Western Super Mare. Anyone wishing to sponsor her can do so via her fundraising site. 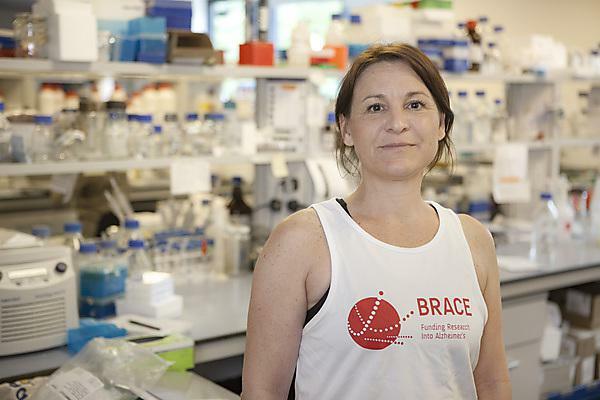 "All the money I raise will go direct to BRACE, which in turn will use it to support research into dementia diseases. It’s a really good way to make sure your donation goes direct to relevant research projects. My aim is to raise £1,000, and I'm about half way there already." "Tracey is to be congratulated for her commitment to this cause. BRACE is a valued partner charity and we hope that everyone will support Tracey in her efforts to raise money for it." "Dementia costs the UK a huge sum each year, mainly in health and social care. Yet research – the key to defeating the condition – accounts for just eight pence in every £10 spent. I salute Tracey for helping us by raising funds in this way and thereby create more resources for urgently needed research."